Memories help define who we are as individuals, and provide common links among communities, cultures and nations. For Tom Meschery, memories of World War II remain etched in the backroads of his mind. A young boy in Tokyo during the war, the former NBA forward can never forget what he witnessed and endured between the ages of 3 and nearly 7. Born in Manchuria, China, to Russian immigrants who escaped that nation’s violent revolution 100 years ago, Meschery, his mother and older sister spent WWII mostly in a Tokyo-area internment camp. 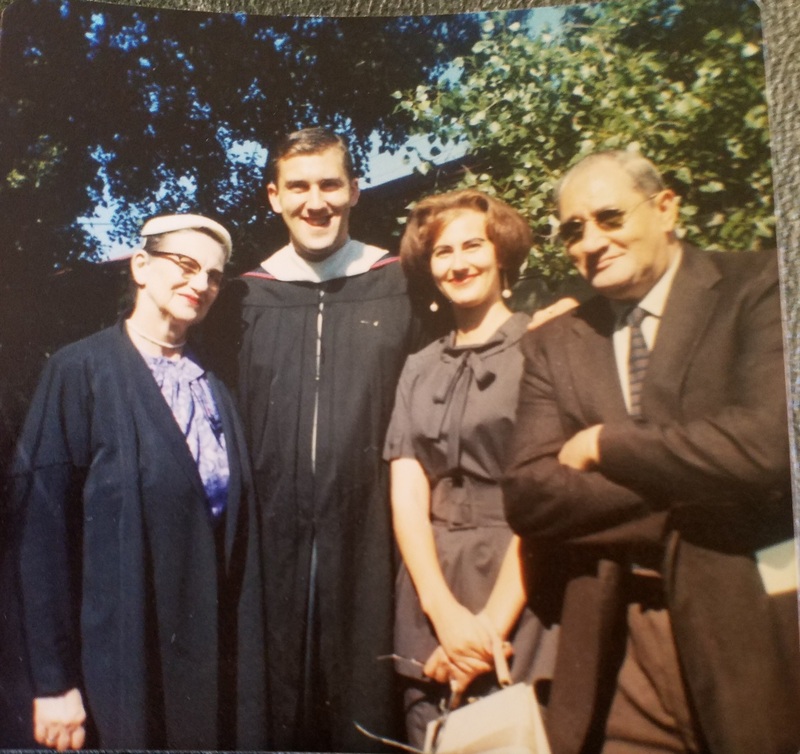 From China, Meschery’s father Nicholas was able to emigrate to San Francisco, but the entire family couldn’t join him during a time of global warfare, lacking passports to travel to the United States. Dozens of internment camps (also called concentration camps) held foreign prisoners of war throughout Japan and numerous other locales controlled or seized by the Japanese empire during WWII. Speaking to Meschery by phone from his home in Sacramento, California, several weeks ago, it was immediately clear that he values his memories, happy ones and traumatic recollections, too. He also recognizes that being controlled by the reality of war as a young boy played a big role in shaping who he became: an intense, bruising star athlete (San Francisco’s Lowell High School and nearby Saint Mary’s College before an NBA career from 1961-71 with the Philadelphia/San Francisco Warriors and Seattle SuperSonics; and later an ABA head coach with the Carolina Cougars), a high school English teacher and writer. 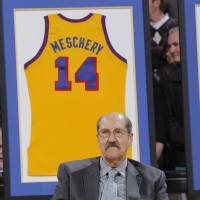 “The camp very well might have turned me into a foodie,” Meschery, who turns 79 on Oct. 26, told Hoop Scoop. “I love to cook and I love to eat. That may have started in the camp when food was very scarce. “Our meals in the concentration camp were frugal — rice and some fish and vegetables. Wherever they are, people try to survive the horror of war. Luxurious items or splurging on extravagance is not expected. Toward the end of the war, Meschery recalled that the Red Cross began to sent food supplies via parachutes for prisoners of war. Among the canned goods in the packages were Spam and corned beef, items Meschery and others in the camps ate repeatedly. But his fondness for food has never diminished, and it’s been a constant struggle for Meschery to maintain his weight. “I’ve been fighting this damn weight all my life, trying not to get fat but loving to eat,” said the ex-forward who started alongside Wilt Chamberlain when the Big Dipper dropped 100 points on the New York Knicks in a 1962 game in Hershey, Pennsylvania, a feat that remains as remarkable and mythical as it was more than a half century ago. In 1999, Meschery’s poetry book “Nothing We Lose Can Be Replaced,” with thoughtful reflections on Russia’s revolution, massive societal changes and his family’s experiences during World War I and WWII, was published. It provided an outlet for him to contemplate the personal and collective experiences shared by Russians in the 20th century. Nearly 20 years later, he speaks without hesitation about what he experienced in Japan. “The Japanese treated us very well aside from the fact that we didn’t have a lot of food,” he said. 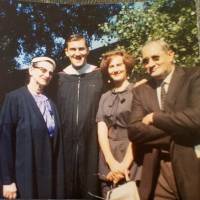 The Meschery family, which altered its original Russian surname (Mescheriakov) in America, was grateful for the kindness of the Japanese guards. And it wanted to show its gratitude after the war ended. What does Meschery first remember about the war? It involves a painful lesson involving the absence of his father, Nicholas. As he grew up in the tightly guarded confines of the war camp, Meschery retained more memories as he got older. “Later, in the last years of the war, those years do come back to me sometimes as nightmares,” Meschery admitted. Recollections of the bombing never vanished. After the church was bombed “our building got on fire, and we were in the basement in the bomb shelter, and we were whisked out through the back of the cellar door, and we were escorted around Tokyo, which was obliterated, literally,” Meschery told me. And the place he knew as home during the war no longer was. For some time, the Mescherys had to survive on the streets. “There were hardly any buildings,” said Meschery, who was the No. 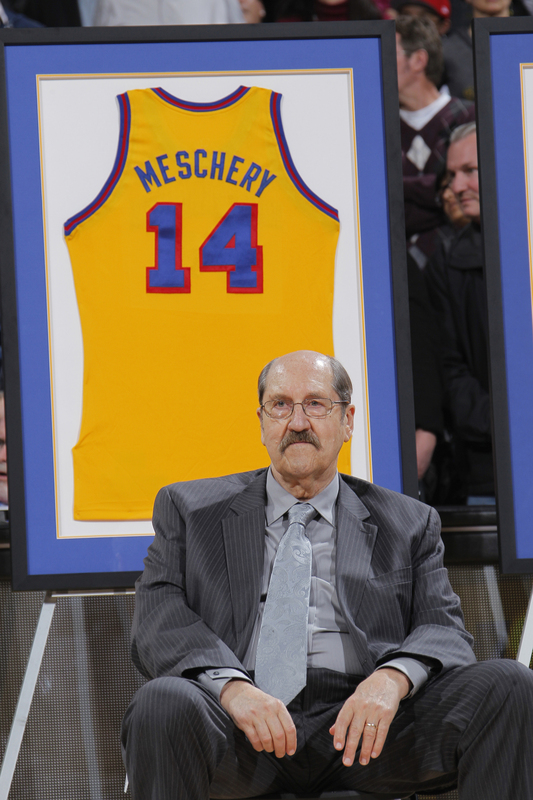 7 pick in the 1961 NBA Draft and an All-Star in 1963. “We slept on the street. We would take some boxes . . . and make a shelter and sleep there, and then move on. And I remember waking up one time and there was an arm sticking out of rubble right next to me. I woke up, and that returns to me as a dream. . . .
Ann Meschery, Tom’s older sister, remembered his optimistic persona during those dark days. During the war, Meschery once fell out of a tree and broke his collarbone. This accident sent him to a hospital, where a Japanese doctor inserted a piece of metal in his collarbone to repair it. He had few prized possessions during the war. But he had two cherished toys: a small, ivory elephant and a green, jade fog. “I would play with those two little toys with the white sheets on my knees, and I created mountains, and the little toys moved as I wished them to move over the mountains . . . It’s an image that I’ve retained,” he said. After the aforementioned church and dormitory were damaged by bombs and fire, the Mescherys eventually found their way to a Tokyo-area convent at another camp before the war’s end. They slept in the attic because there wasn’t room anywhere else, and Meschery was there when Japan surrendered to the Allied forces in August 1945. “It was a dreadful sight. . . . We were there in that attic when the end of the war was announced,” Meschery said. “The director of our internment camp came into the attic and he was weeping, and he bowed very low to us, and very stiff, very formally and announced that the war was over and he was crying. I remember he ran out of the room he was so distraught. The Mescherys departed Japan on a ship and reunited with the family patriarch in San Francisco, where they established roots. But before the City By The Bay became home, there was the monumental arrival day in America. And Meschery will never forget it. From time to time, Meschery and his sister will discuss WWII and being in Tokyo at that time “as siblings will do,” he noted. They’ve spoken about the aerial bombardment of Tokyo, and where they were throughout the U.S. military’s air raids of the capital. One horrifying incident stands out among their many shared memories. “There was a beautiful cherry tree outside the wall of the concentration camp, and I always remember that being so beautiful,” Meschery underlined. “There was more than one, and I remember that one of them caught on fire. It was burning and I felt terribly sad about that, and then the fire that burned our concentration camp, my sister actually ran back into the fire, into the upstairs to the bedroom and we thought she was going to die, frightened to death. Ann Meschery remembered the tale with additional details. “One story that has become family folklore is that, when Tom was born, I was so thrilled I had a new baby brother, that I gave him my most precious possession, my stuffed teddy bear,” she wrote in an email. “Tom and that bear became inseparable. When we were in the internment camp and the building was burning from the dropped incendiary bombs, we were told to evacuate and to leave everything behind. Tom was told to drop his bear. When we got outside, I could see he was really upset and crying that he had to leave his bear behind. I said, no way, and promptly marched back into the burning building and retrieved the bear. As the chaos unfolded, Tom and his sister had a close-up view of the destruction of Tokyo. Looking back on how the war shaped their lives, Ann Meschery said it had a profound impact. “I think by witnessing the actual bombing of Tokyo we both understood the realities of war at a very young age. And seeing the results of war, the people with flesh burnt beyond recognition and wandering around a burning city during the incendiary bombing of Tokyo armed us with a certain toughness, even as children,” she revealed. “I think this early toughness shaped his attitude toward everything he later did. I know it certainly did shape my own life. For me, seeing the ravages of war has made me a lifelong pacifist. . . . The war presented plenty of confusion for the young Meschery. In his mind, there were no clear-cut good guys and bad guys. After all, as he pointed out in our conversation, he and his family felt they were treated quite well by the Japanese guards. Meschery acknowledged that he hasn’t studied WWII extensively through books, documentaries and other means. The Nagase family was interned at the Tule Lake Relocation Center in northern California during WWII. Nagase and Meschery both graduated from Lowell High in June 1957. At St. Mary’s, where Meschery received a basketball scholarship, he met Dr. Ted Tsukahara, now the director of the school’s John F. Henning Institute and a former student sportswriter who covered the Gaels basketball games. The Tsukaharas were sent to a Utah concentration camp, Meschery said.